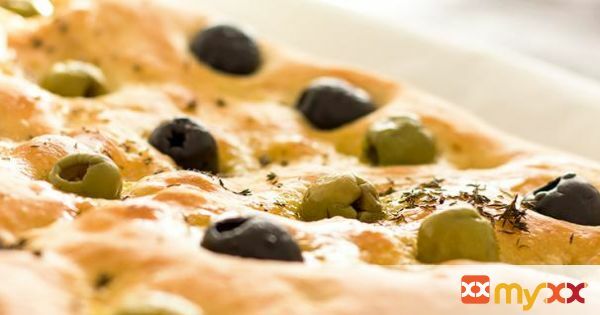 Focaccia Bread is perfect for any occasion! Its topped with olives and drizzled generously with extra virgin olive oil! 1. Mix water with fresh yeast (if using) and sugar. Place aside for later. If you are using dry yeast, simply omit this step and add the yeast right into the flour. 2. In a large bowl, sift flour and add all the ingredients except for thyme. Mix until all the ingredients are well combined. Transfer onto a floured work top and knead until you get nice soft and elastic dough (this will take about 5 minutes). 3. Oil your bowl with olive oil and place the dough in. Cover with cling film and let it rise until it has doubled in size (30 mins – 60 mins depending on the room temperature). 4. Once the dough has doubled in size, transfer it onto a baking tray lined with baking paper. Using your hands spread the dough across the baking tray. With your fingers make a lot of wells on its surface. 5. Pour over some extra virgin olive oil, season with thyme and top with olives (as many as you like). 6. Bake in a preheated oven at 200 C/400 F for 40 minutes or until ready. 7. This bread is so delicious and versatile you can eat it on its own, dip it in some more olive oil or as a part of a party platter!